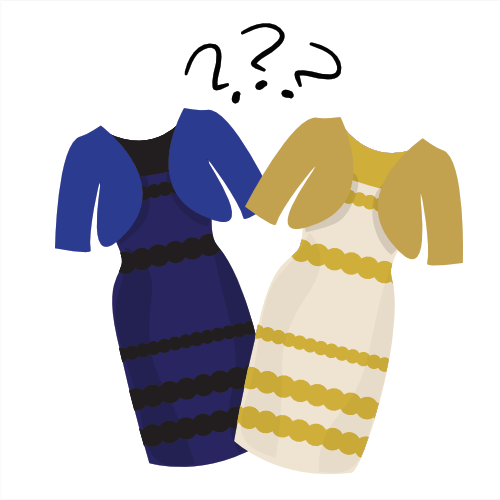 …Is the dress white and gold or blue and black? 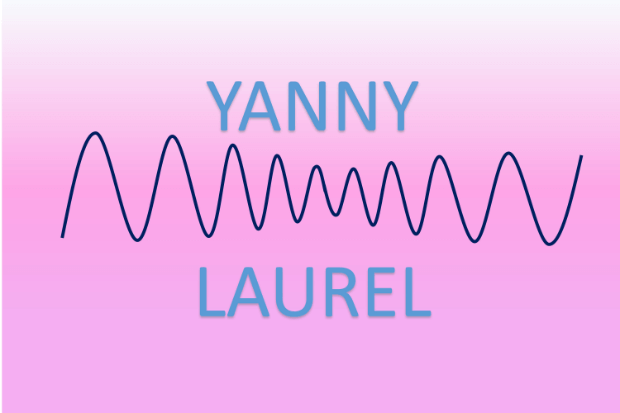 …Do you hear “Yanny” or “Laurel”? And, maybe more importantly to you, which is better for marketing: email or social media? There are more than 4.3 billion Internet users in the world and nearly 80% of them have social media accounts. Actually, an average of 5.5 social media accounts. That’s huge! Nearly all of them have active email accounts. So, what’s a smart marketer like you to do? 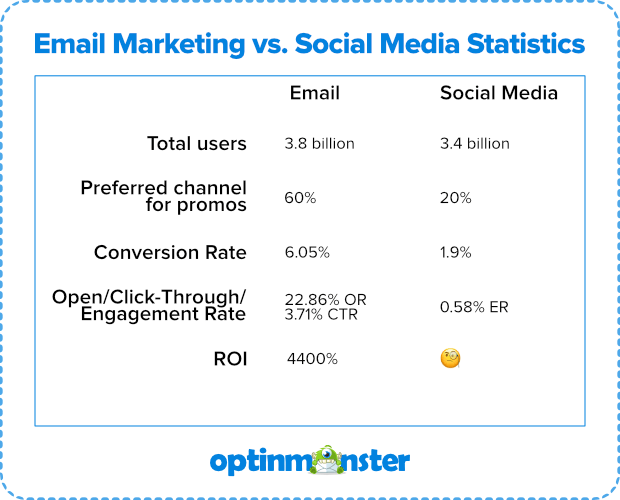 In this post, we’ll share the statistics and forecasts for email marketing vs social media performance from 2016-2019 and beyond. Over the past decade, social media visitors have grown at an exponential rate. Not surprising, right? Ten years may as well be a million when it comes to technology. It’s clear that social media is not a fad but is a channel, like email, that can be used to reach your target audience. In fact, 83% of marketers say that social media is important for their business. In light of these trends, some marketers are wondering, will social media replace email? The truth? Email’s not going anywhere for a good, long while. 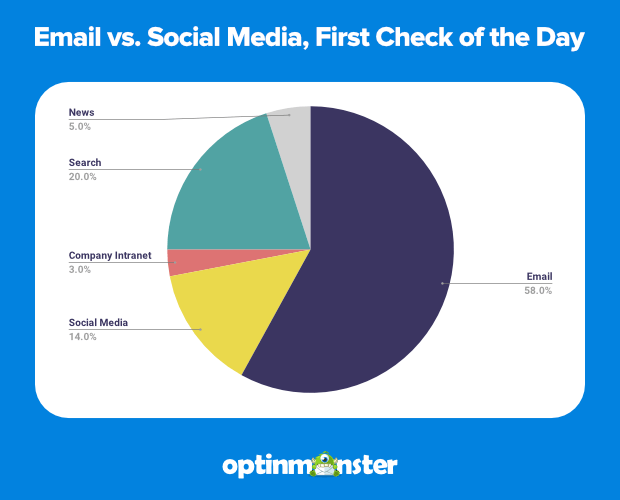 When you look at the effectiveness of email compared to social media and take a peek at the ROI of each, it’s pretty clear that email is the winner. By a lot. But here’s the thing: if you really want to make the most of your email marketing and engage your target audience in a new way, add social media to your marketing plan. In this post, we’ve compiled the latest email marketing and social media statistics and forecasts. Let’s look at the overview of email compared to social media, and then we’ll explain what all of this means for you as an online marketer. Yes, that IS an emoji instead of a number for the social media ROI. And, yes, we WILL talk about why when we get there. For now, let’s talk for just a quick second about why we chose these stats to cover. We’re talking in terms of total users instead of accounts so you can get an idea of the number of people. Accounts don’t make purchases, right? People do. But, if you’re interested, there are something like 8 billion email accounts (enough for every person in the world to have 1.55). Also, every social media user has an average of 5.54 accounts. The most popular ones are exactly the ones you’d think: Facebook (by A LOT), Instagram, Twitter, Snapchat, WhatsApp, etc. The number of users for both email and social media is going to continue to climb. But numbers alone are of little importance to you, right? You want to know who these users are: behaviors, demographics, what motivates them. Not only does email have the largest user base overall, but it also has the largest user base of any age group. Of course, age barely begins to scratch the surface of the many ways that your particular customers may use email or social media differently. There are so many ways you can use segmentation to learn about the specific demographics and psychographics that make your customers unique. Learn about 50 smart ways to segment your audience so you can target your message to increase conversions, regardless of the channel you use. No, not once you start working. We’re talking those moments in the darkness after you’ve shut off your alarm but before you’re actually fully awake. Your phone is in your hand, you’re still warm and snuggly in your bed, it’s oh-so-tempting to go back to sleep. But you don’t. Instead, you open your email. Well, 58% of you do, anyway. And so do 58% of your customers. Additionally, these email-first individuals are said to be more task-oriented online than the people who start their day on Facebook, Instagram, or Twitter. In other words, they are more likely to approach online interactions with specific goals in mind, like finding deals, promotions, or new product information. But with the rise of mobile, consumers have ready access to both email and social media. 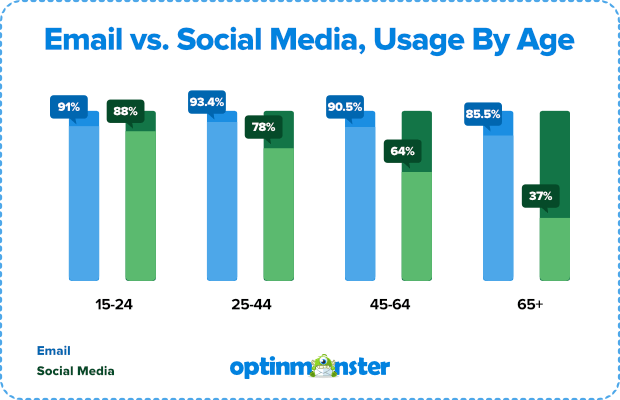 This means that while users head to their email first, social media isn’t long after for those who use it. So, perhaps a better measure of each platform’s marketing usefulness would be how consumers use the platform to communicate. It turns out that 60% of consumers subscribe to a brand’s email list to receive promotional messages compared to 20% of consumers who will follow brands on social media to get deals. That’s great news for email marketers! Which Drives More Sales: Email or Social Media? We know that 60% of consumers sign up for brand emails with the expectation of getting promotional emails in their inbox, but the same can’t be said for the 20% of folks who follow brands on social media. The truth is, people follow brands on social media but don’t actually want those brands to slide into their DMs. Deals and discounts are important for driving sales, so where do consumers go to look for them? When people want to find a special deal, email is the go-to channel. 44% of users check their email for a deal from a company they know, whereas only 4% will go to Facebook. So consumers are totally fine with receiving your promotional emails, and they actually want to find deals in their inbox. But do these promotional emails really work to drive sales? 60% of consumers state that they have made a purchase as the result of a marketing message they received by email. On the flip side, only 12.5% of them even consider a buy button as a purchase driver on social media. It’s definitely not a fear of purchasing online that creates this hesitation since 93.5% of global internet users have purchased products online. Plus, just under half of global internet users trust social media for product research. Making the jump from social research to social purchase, however, seems to be a tough nut to crack. 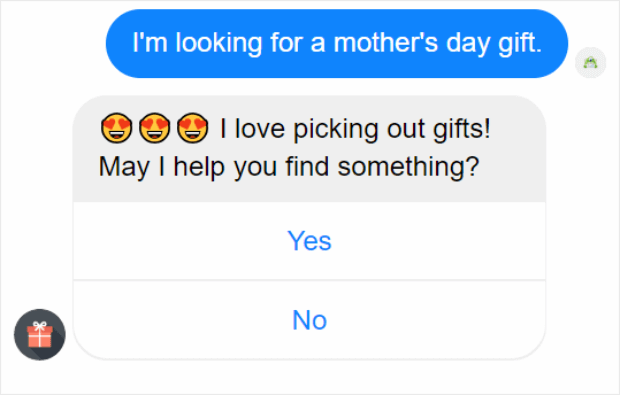 Researchers think that chatbots may be the way to bridge this gap by keeping product research, customer service, and purchasing together in a single place. Bottom Line: Email marketing is the best way to make sales online. But, you should definitely check out our new ChatBot element (OptinMonster Growth Plan required) to get a jump start on those social purchasing numbers. Which Has Greater Reach: Email or Social Media? This may come as a bit of a surprise, but social media doesn’t have a great engagement rate. Barely over half a percent, in fact (0.58%). Not quite the social powerhouse you were expecting, huh? On the other hand, email reaches about 85% of the people you send it to (this is called the inbox placement rate) and has an open rate of almost 23%. To increase your organic reach on social media, people have to actually engage with your posts, and this can be difficult to accomplish. But with email, you can increase your inbox placement rate simply by following best practices to make sure your emails don’t go in the spam box. When asked what is the most important measurement to gauge the effectiveness of any given channel, most marketers agreed that the overall return on investment (ROI) is the most important. 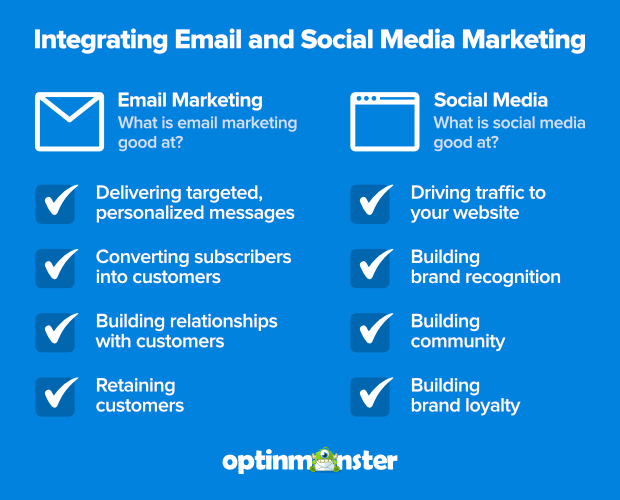 So which yields the greatest ROI: email marketing, or social media? Email marketing yields $44 back for every $1 you spend – a 4400% ROI. Wondering what’s the ROI for social media? So are we. So is everyone. Unfortunately, there just isn’t a great way to track it. While one brand may have a method that works for them, another brand probably tracks it a completely different way making comparisons between the two entirely meaningless. For the best return on your investment, focus on email marketing but develop a social media marketing plan that makes sense for the audience you’re trying to reach. Social media is great for driving traffic to your website. You can do that organically by making your content go viral, or by paying for social media ads. User-generated content is also HUGE on social and can be an excellent driver of traffic and leads. Email marketing is awesome for generating leads, driving sales and increasing customer retention. 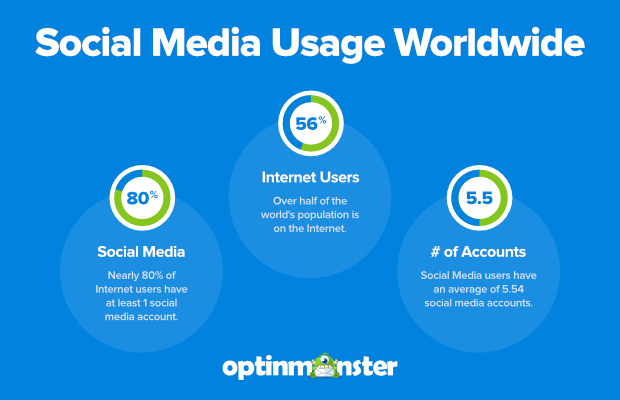 Simply put, you can and should use social media to drive visitors to your website, where you can use the power of OptinMonster to convert those visitors into subscribers. Got thoughts to share about email vs. social media marketing? Share them with us in the comments!